Cotoletta is most likely an adaptation of the southern Italian word costoletta, meaning ribs or cutlet, or it may come from the French côtelette. Though the origin and the spelling of the name are uncertain, the dish itself is not. 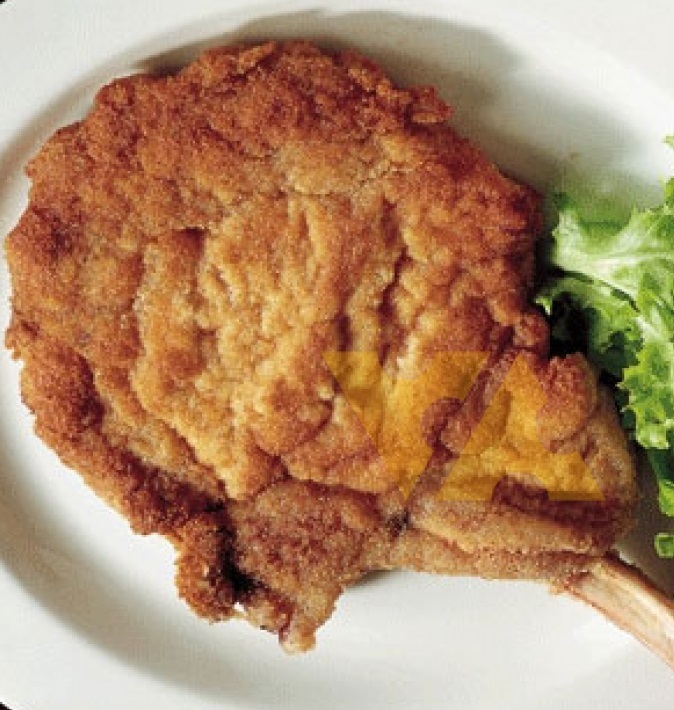 It is a portion of meat, usually veal, fried in breadcrumbs and in its most famous form, it is called cotoletta alla milanese. Today, the technique extends to chicken, turkey and even vegetables. In dishes like these, the name describes the manner of preparation and simply means that the food has been fried with bread crumbs. The origin of the dish is as obscure as that of the name and its spelling, with both Austrians and the Italians claiming to have invented it. Proof that cotoletta alla milanese is a Milanese invention is in fact provided by two historical documents. The first is a “menu” from 1134, for a meal given by an abbot to the choristers of Sant’ Ambrogio. The list of dishes includes “lumbulos con panito”, sliced loin in breadcrumbs. This evidence of a Lombard specialty is quoted in Pietro Verri’s, Storia di Milano. A second item of proof is a letter written by the Austrian general, Field Marshal Radetzky, to the Imperial Staff Officer, Baron Attems. After various comments and pieces of information, the general writes of the cotoletta and describes the method of preparation, speaking of it as a new discovery. Perhaps it was the Austrians who learned the dish from south of the Alps – the Milanese certainly believe so. You probably do not want to get into the middle of that argument. In any case this is a delicious dish to make and the only decision you need to make is what to serve with the pork. I have given you a number of choices that I think go well with a milanese recipe. Choose one. Place each pork chop in a separate large resealable plastic bag and, using a rolling-pin, gently pound each chop until it is about 8 inches in diameter and about 3/4-inch thick. Remove each chop from the bag and coat with a drizzle of olive oil and season with salt and pepper. In a food processor, pulse the bread cubes into fine crumbs (you should end up with about 3 cups of crumbs). Place the crumbs into a large paper bag. In another large bowl, beat the eggs with 1 teaspoon of sea salt and 1 tablespoon of olive oil. 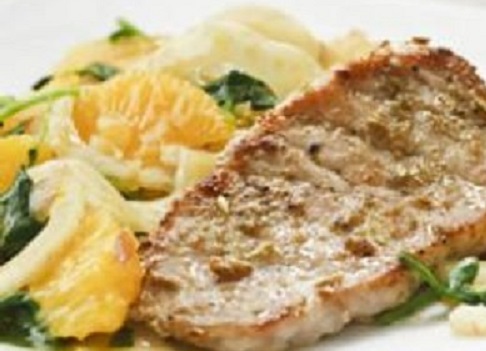 Place the pork chops in the flour, coat them well and then dip each one into the egg mixture. Transfer the chops to a rimmed baking sheet, drizzle with the remaining egg mixture, cover with plastic wrap and refrigerate for 1 hour. Transfer the chops, one at a time, to the bag with the bread crumbs. Close the bag and shake well to coat each chop thoroughly. Preheat a skillet large enough to hold 2 chops in a single layer. Add 2 tablespoons of olive oil and 2 tablespoons of the butter and heat over medium heat until the butter is golden brown. Place two chops in the pan and cook for 4 to 5 minutes on one side. Using a spatula, gently turn each chop. Cook for 3-4 minutes longer. Remove from the heat and transfer the chops to a platter. Add 2 tablespoons lemon juice to the pan, stir to deglaze and pour the juices over the cooked chops. Polenta comes in three types of grinds: fine (which has a consistency similar to wheat flour), semi coarse and coarse. In a large saucepan, bring 5 cups of salted water to a boil. Slowly add the polenta and whisk constantly until tender, about 7 to 10 minutes. Use a wooden spoon to stir in the butter, corn and mascarpone cheese. Season with salt and white pepper. Set aside. In a large skillet set over medium heat, heat the olive oil and add the mushrooms. Cook until they soften slightly, about 7 to 10 minutes. Add the shallot and garlic and cook until translucent. Season with salt to taste. Stir the herbs and Parmesan cheese into the polenta and spread the polenta onto a serving platter. 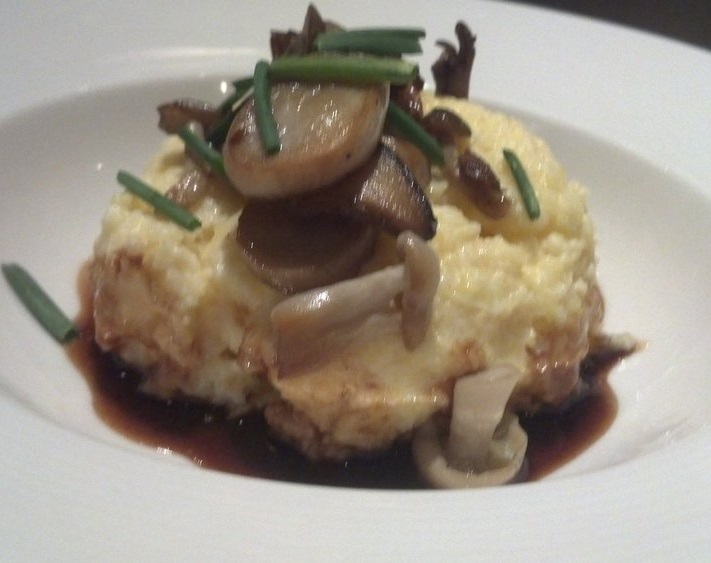 Spoon the mushrooms onto the center of the polenta and drizzle lightly with truffle oil. Sprinkle with chives and serve as a side to the grilled pork chops. 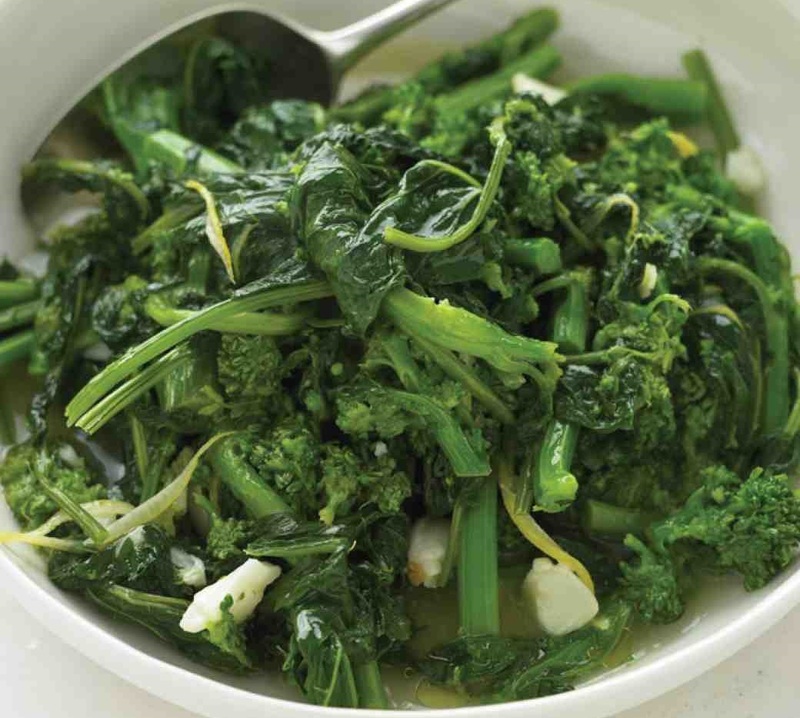 Look for broccoli rabe with vibrant green leaves and plump stems. Small-leaved plants are young and therefore mild-tasting. Transfer contents of pan (including liquid) to a serving bowl. Grind pepper over top and drizzle with olive oil and lemon juice. Serve immediately. Preheat the oven to 350°F. Line a rimmed baking sheet with foil. Place the fennel on the prepared baking sheet and toss the wedges with 1 tablespoon of the olive oil. Season with salt and pepper and roast until tender and the edges are browned and crispy, 30 to 35 minutes. 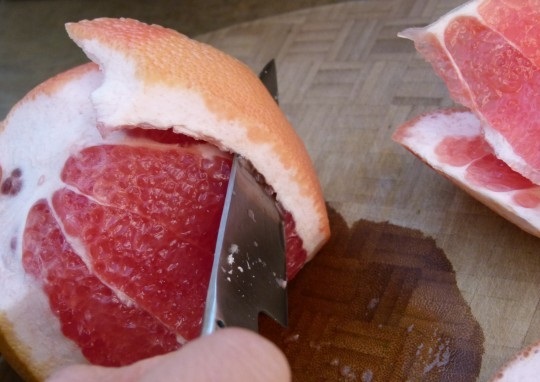 Grate the zest of the grapefruit into a bowl. 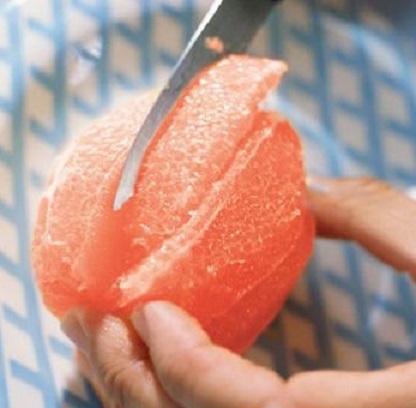 Using a sharp knife, trim ¼ inch to ½ inch off the top and bottom of the grapefruit so it stand flat on a cutting board. Following the curve of the fruit, remove the white pith and the membrane covering the fruit. Cut in between the membranes to remove the fruit and place them in the bowl with the zest. Squeeze what remains of the grapefruit over a small bowl or measuring cup to release any juice still left in the grapefruit. 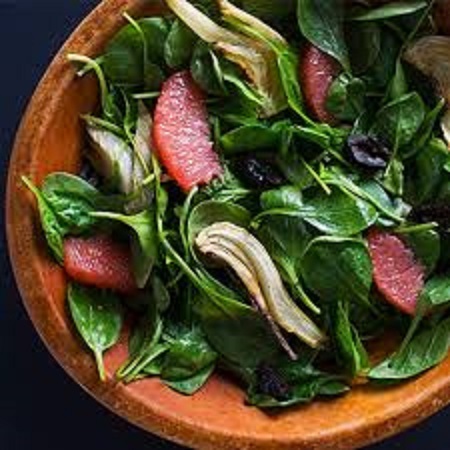 In a large salad bowl, combine the spinach, olives and grapefruit segments. Add the roasted fennel along with 2 tablespoons of the reserved grapefruit juice and the remaining 2 tablespoons of olive oil. Season with salt and pepper and toss to combine. Serve as a side to the pork. In a large sauté pan or skillet over medium heat, add 2 tablespoons of the olive oil, divided. Add the garlic and cook until brown. Add the chard and potatoes. Season lightly with salt and pepper. 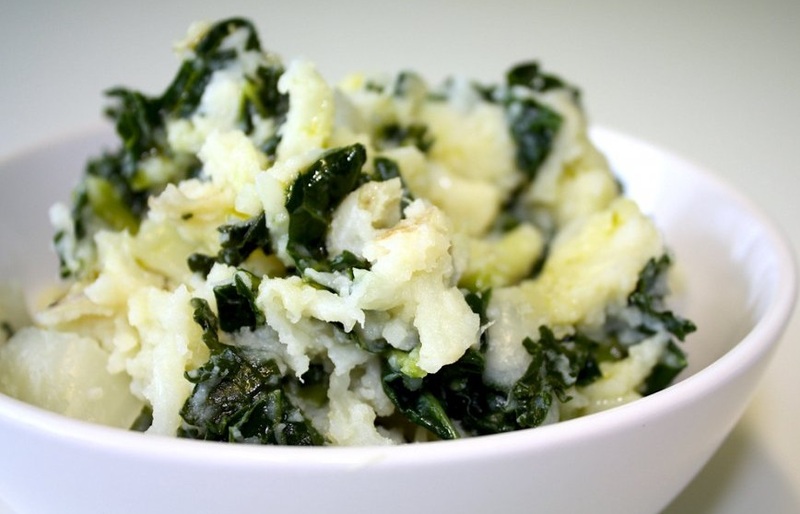 Sauté, stirring and mashing the potatoes, until the liquid has evaporated and the potatoes are coarsely mashed. If the potatoes begin to brown, reduce the heat. Add the remaining 2 tablespoons of olive oil, season to taste with salt and pepper, and mix well. Serve as a side with the pork. Citrus fruit (grapefruit, lemons, limes and oranges) are at their best in the winter and can add a burst of flavor to your recipes. These fruits are a rich source of vitamin C, which helps protect you from infection, can help keep your skin smooth, heals wounds and cuts and assists in red blood cell formation and repair. A little bit of lemon zest brightens up morning pancakes while some freshly squeezed orange juice can be used to marinate mahi-mahi before grilling it. Try these suggestions for adding citrus fruit to your menu. Make citrus fruit salad and include all of your favorites Try it with a sprinkling of unsweetened coconut flakes or a bit of raw honey and a sprinkling of nuts. Enjoy citrus for dessert with a square of dark chocolate. Pair with almost any variety of cheese. Hard, salty cheese adds wonderful balance and flavor to the sweet acidity of the fruit. Stir into Greek yogurt, cottage or ricotta cheese and eat as is or with a bit of honey or sliced dates for breakfast or a snack. Cut into rounds and serve with a leafy green salad for a beautiful presentation. Add citrus to smoothie blends, such as green apple and parsley. Dip citrus segments into sweetened cream cheese dip or spread with your favorite roasted nut butter. Use citrus zest to add flavor to condiments. 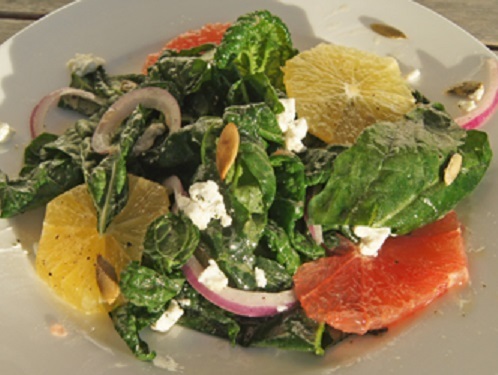 Add citrus segments to whole grain salads. Heavy citrus fruits with firm rinds will have the most juice. 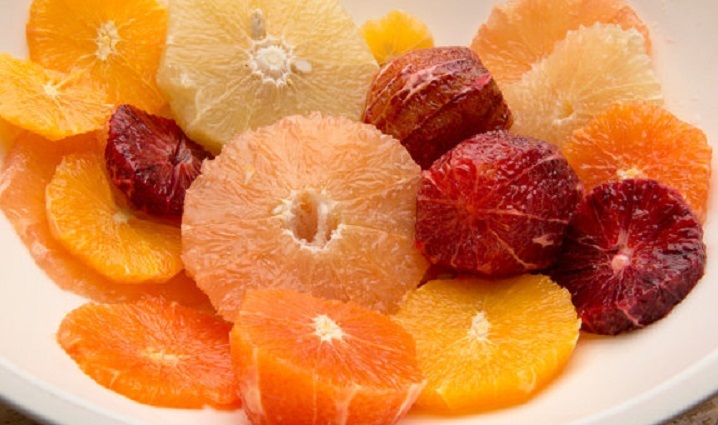 Citrus fruits will stay freshest when wrapped in a plastic bag and stored in your refrigerator’s crisper drawer. Fresh-squeezed juice and citrus zest can be frozen for later use. When a recipe calls for strips of zest, a vegetable peeler works well. But for fluffy, grated zest, try using a microplane zester. Cut off the top and bottom of the fruit and stand it up on one end. Slice downward to cut away the skin and pith, moving around until all is removed. Holding the fruit over a bowl, slice along both sides of the membrane to release the segments. Lacinato kale is a variety of kale used in Italian cooking. It is also known as Tuscan kale, Tuscan cabbage, Italian kale, Dinosaur kale, cavolo nero, black kale, flat back cabbage, palm tree kale or black Tuscan palm. Lacinato kale has been grown in Tuscany for centuries. It is one of the traditional ingredients of minestrone and ribollita. Combine in a bottle or small bowl. Mix well before using. Mix kale, pine nuts and onion in a large bowl. Season salad with salt and pepper. Cut goat or feta cheese into small pieces and mix into the salad. Toss the salad with enough dressing to coat the leaves. Arrange grapefruit sections on the salad after it is put on the plate so they do not break. In a large saucepan, cover the rice with the 3 cups of water, season with salt and bring to a boil. Simmer over moderate heat until the rice is tender and the water is nearly absorbed, about 15 minutes. Transfer 1/2 cup of the rice to a blender and spread the remaining rice on a plate. Add the chicken stock to the empty saucepan and bring to a simmer. Add 1 cup of the hot stock to the blender with the rice, cover and puree until the rice is smooth. With the machine on, add the egg yolks and lemon juice and blend until smooth. Season with salt and pepper. Stir the mixture into the hot stock and keep warm over low heat. In a medium bowl, mix the meat with the onion, mint, 2 tablespoons of the dill, 1/4 teaspoon of the lemon zest, 2 teaspoons of kosher salt and 1/2 teaspoon of pepper. Form the mixture into 1-inch balls. 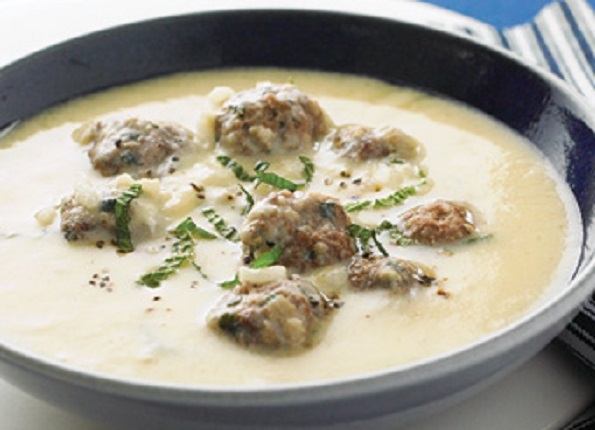 Lightly dust the meatballs with flour, tapping off any excess, and drop them into the warm soup. Increase the heat to moderate and simmer until the meatballs are cooked through, 8 to 10 minutes. Stir in the reserved rice and the remaining 1 tablespoon of dill and 1 teaspoon of lemon zest and season with salt and pepper. Ladle the soup into bowls, garnish with dill or mint and serve. In a large skillet, combine peas, cream, garlic and 1/4 teaspoon of salt. Cover and simmer for 5 minutes. Stir in spinach and cook uncovered until leaves are wilted. Remove pan from the heat and mix in lemon zest and juice. Meanwhile, in a large pot, bring salted water to a boil. Add gnocchi and cook until they float to the top, about 4 minutes. Drain gnocchi, reserving 1/2 cup of the pasta water. 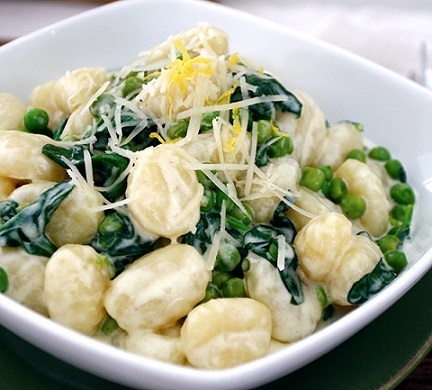 Mix the drained gnocchi with the cream sauce in the skillet. Add the reserved pasta water and stir to coat. Top with grated Parmigiano-Reggiano and serve. Remove the skin and white pith from oranges with a sharp knife. Working over a bowl, cut the segments from their surrounding membranes. Squeeze juice in the bowl before discarding the membranes. Transfer the segments with a slotted spoon to another bowl. Whisk lemon juice, sugar, cornstarch and 1/4 teaspoon salt into the bowl with the orange juice. Set aside. Season pork chops on both sides with fennel seeds and the remaining 1/4 teaspoon salt and pepper. Heat oil in a large nonstick skillet over medium heat. Add the chops and cook until browned and just cooked through, 2 to 3 minutes per side. Transfer to a plate and tent with foil to keep warm. Add sliced fennel and shallot to the pan and cook, stirring, for 1 minute. Add arugula and cook, stirring, until it begins to wilt, 1 to 2 minutes more. Stir in the reserved orange segments, then transfer the contents of the pan to a large serving platter. Place the pork chops on top. Add the reserved orange juice mixture to the pan. Cook, stirring constantly, until slightly thickened, about 1 minute. Pour over the pork chops and serve. Preheat the oven to 350˚F. Grease a bundt pan with olive oil, then dust with flour. In a large mixing bowl, combine oil, eggs, yogurt and lemon juice. Stir in sugar. In another bowl, sift baking powder and flour. Once combined, slowly add the flour to the wet ingredients as you mix. Pour batter into the pan and bake for about 40 minutes. Test with a toothpick for doneness. It should come out clean. Remove cake from the oven and allow to rest. Once it has cooled, turn it onto a plate. 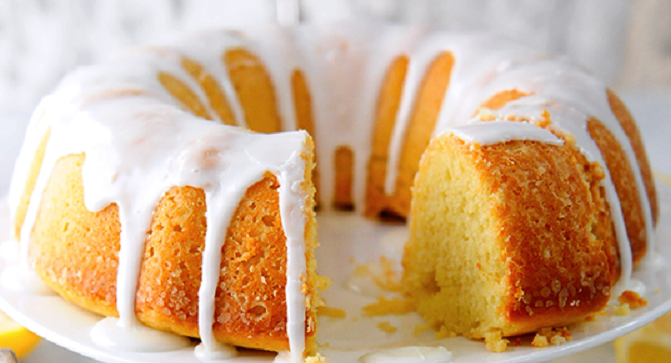 To create the icing, mix sugar and lemon juice together until smooth. Drizzle the over the cooled cake.